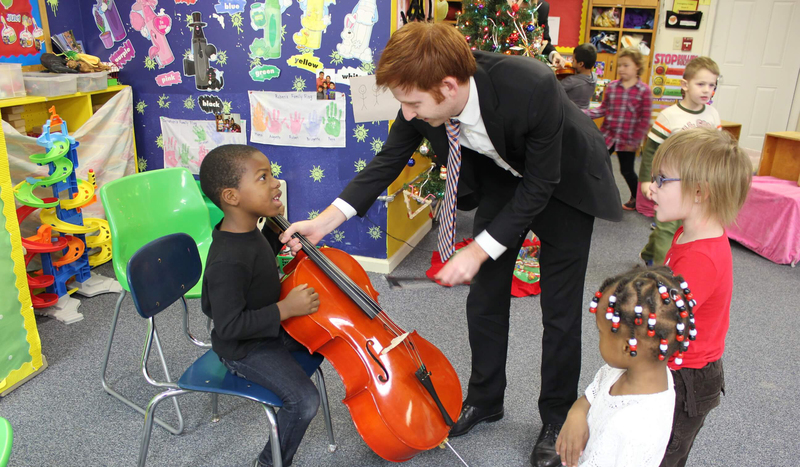 The North Carolina Symphony leads the most extensive music education program of any symphony orchestra. Each year, we serve more than 55,000 North Carolina students of all ages and provide training and resources for teachers in alignment with the curriculum set by the North Carolina Department of Public Instruction. Music education has been a pillar of our mission for more than seven decades, and we are proud to build the next generation of musicians and music lovers. We are grateful to our music education supporters for their dedication to the importance of the arts in the lives of young people. Fourth and fifth graders all across the state of North Carolina experience live music performances by NCS that teach core musical concepts. As students grow in their musical pursuits, they have opportunities to work directly with NCS artists and perform for NCS audiences. Music Discovery, part of PNC’s Grow Up Great program, combines music with storytelling for preschoolers and their families. NCS values and recognizes the work of outstanding music educators in North Carolina, with whom we carry out our music education mission.